Traverse rod cord replacement kit.Save money, time and stress by replacing worn cord on your traverse rod. It is not necessary to remove the traverse rod from it's installation with this kit that has everything needed to renew your existing rod. Cord for up to 12 feet wide traverse rod 8 feet off the floor. Use with Superfine and Empire traverse rods. Kirsch drapery rod brackets for double rod installation. Returns 5 1/2" and 6 1/2", Clearance 1" and 1 1/2". Best curtain rod hardware. Double rod drapery hardware. 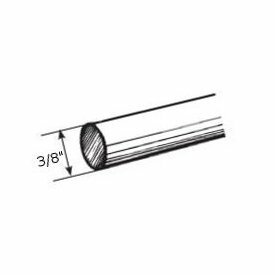 Front to back (Return): 3 1/2" to 4 1/2"
Corner curtain rod hardware to use regular two inc poles for corner windows or bay and bow windows. Use with 2 inch Wood Trends collection for color match. If you are looking for corner curtain rods, you have found the ultimate solution.Use for corner curtain rod or bay window curtain rod treatments. 7 1/4"long, 2 1/2" wide, q 3/4" recess depth. Use with the 2 inch Wood Trends collection for color match. Use with the 2" wood trends pole for color match. Kirsch wood trend 3 inch fluted wood drapery pole. Wood drapery rods. Use as swag curtain rod. Wood drapery rods by Kirsch. Use as swag curtain rod. Modern curtain rods. Kirsch's reputation for quality and elegance was built on Wood Trends. These classic styles in rich colors and subtle grains complement wood furniture finishes and architectural details, allowing for a totally original design statement. With a wide assortment of components such as elbow brackets, swivel sockets and holdbacks, Wood Trends is not only timely but also functional. Note: Some colors have surcharge added. Graber Double curtain rods 48"-84"
Graber Double curtain rods 84"-120"
Graber Double curtain rods 18-28"
Graber Double curtain rods 28-48"